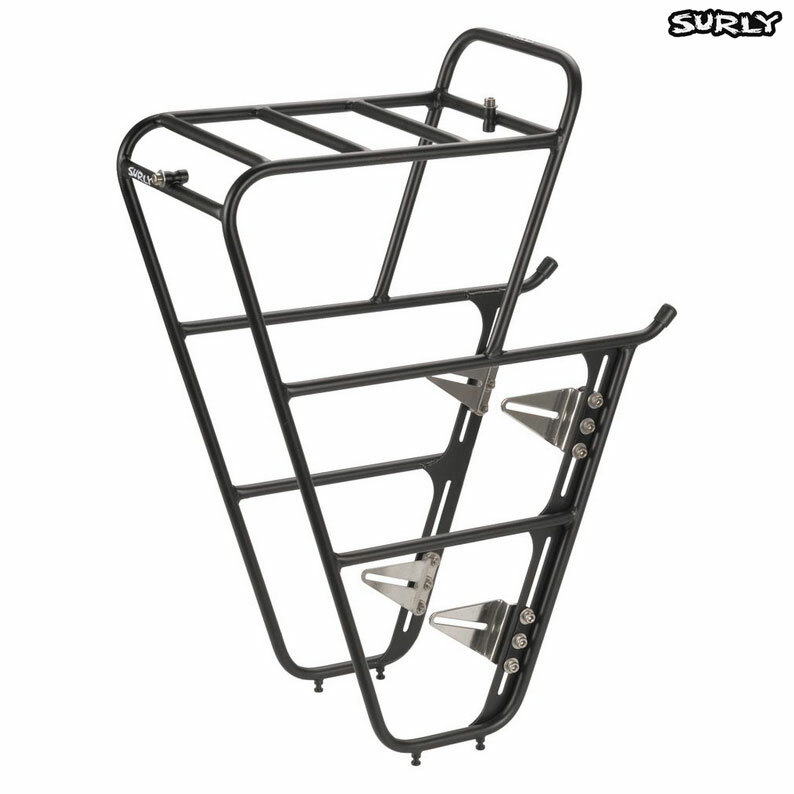 The Surly Front Rack is fully adjustable to accommodate most forks. It works on forks that have 26-29" wheel with or without fenders, including all Surly forks. . . Except the Pugsley fork and Moonlander forks (due to the offset of the Pugsly fork's driveside blade and the width of the Moonlander fork). The stock rack and hardware is designed to fit Surly road touring forks. Additional hardware is need to accommodate other forks, and can be found by contacting Surly or your local bike shop. The height of The Surly Front Rack can be fine tuned to keep the weight of your cargo as low as possible. And, you can get the angle of your rack parallel to the horizon, regardless of your fork rake, curve radii, or braze-on locations. Your panniers can ride high or low. Keeping your weight low keeps your bike stable. But, in some cases you'll want to run your panniers high to keep them out of the tall grass or mud (if you're riding on heavily rutted roads or trails). This rack is truly versatile. I have a SON Edelux II light fitted to the crown of my forks. Will it work as it is this rack, or will it need mounting on the rack itself? You will need to mount the light elsewhere as the rack will not fit to the bike with the light on the crown of the fork. Can use this rack on a 700c gravel bike with disc brakes on? I am looking for the right front rack onto my Jamis Renegade Exile 2016. The frame size is 56 cm. Looking at the bike in question, we would not recommend that any front rack would be suitable on the stock forks. Your options could be using a handlebar mounted or steerer tube mounted bag / rack. As we do not stock that particular bike we would'nt have anything to refer to in terms of fitting im afraid. Hello, does this rake fit an old mountain bike fork with cantilever brakes? Does it need additional hardware? This rack is designed to fit most forks as it is fully adjustable. In terms of needing extra hardware it would be hard to say without knowing which forks you have. Is there any technical drawings for this rack. There is non on surly's website and it would help a lot for checking compatibility. Yes this will fit many different forks that are not Surly forks. Is the hardware kit included in the price? Hi, yes a fitting kit is included with this rack. Thanks. This Surly front rack will be fine for use on a 700c LHT fork. What's different with the 2.0 version of the Surly Nice Front Rack compared to the old one? The 2.0 racks have different hardware and plates to make them better as disc compatible out of the box. The general construction of the main rack has not changed. Will I Need A P-Clamp To Mount? Do You Have A Bracket For Attaching A B & M Lumotec Iq-X To The Front? The mounting point on the front of this rack is designed to work with normal fork crown fitting brackets that come supplied with dynamo lights. The bracket that came with your light will fit directly to this rack or if you require a new one practically any fork crown fitting dynamo light bracket will work with this rack as well as your light. I have a Disc Trucker fitted with a BUSCH & MÜLLER Lumotec IQ2 Luxos U at the moment (50cm frame=. Was wondering whether this rack would work with the light fitted as it currently sits (just at the crown of the forks), or would it need some bodging...and if so where do you reckon the light would go? Not so keen popping the light right at the front of the rack, as that looks a bit fragile! Thanks! Fitting this front rack would interfere with the front light if it is mounted to the fork crown. Fitting a light to the front of this rack is possible and is quite stable, other options though would include running a longer cable and fitting the light to the handlebars. is in this case the carrier mounting hardware? all of the mounting hardware required to fit this rack is included with the rack.